Since we’ve recently looked where Christianity is hot and where it is not, it seems appropriate to also look at the countries where it is difficult to be a Christian. The organization Open Doors tracks the top 50 countries where the persecution of Christians is the highest. The map above shows those countries. Further information about each of these countries can be found at http://www.worldwatchlist.us/ so that you can “remember the prisoners, as though in prison with them, and those who are ill-treated” (Hebrews 13:2). Several readers of a previous article, “The Top 20 Countries where Christianity is Growing the Fastest,” commented that persecution does not always limit church growth. In fact, it may accelerate church growth. How true is this observation? 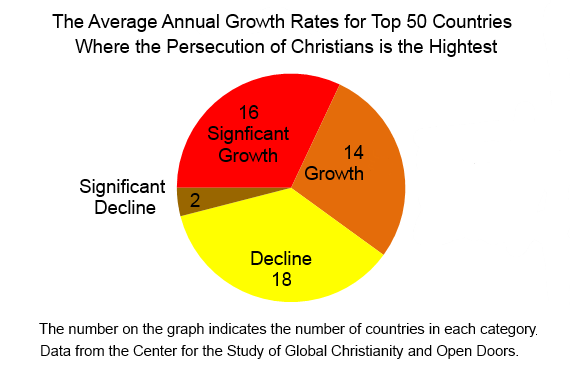 The following graph depicts the projected Average Annual Growth Rates for the period 1970-2020, as determined by the Center for the Study of Global Christianity, for the top 50 countries where persecution of Christians is most severe for 2013, as indicated by Open Doors. In order to categorize these countries, I determined the global mean for the growth of Christians (1.47%) and the standard deviation (2.05). These measures provide guidance in categorizing the 50 countries into the categories of Significant Growth, Growth, Decline and Significant Decline. Since 30 countries of the 50 countries where persecution is most intense fall into the category of “significant growth” or “growth,” it appears that persecution is not always significant deterrent to church growth. It is rather striking that eleven* of the top 20 countries where Christianity is growing the fastest are also on the top 50 persecution list. On the other hand, considering that the majority of countries where there is freedom of religion is permitted are in decline or evidence low growth, as indicated in “Is Christianity being accepted or rejected in your country”, it could be that freedom of religion actually contributes to the decline of Christianity. So then, what is your perspective on the relationship between persecution and church growth? *The eleven countries were Christianity is growing at a significant rate and a high level of persecution are: China, United Arab Emirates, Saudi Arabia, Qatar, Oman, Yemen, Bahrain, Bhutan, Mali, Brunei and Kuwait. This entry was posted in mission information and tagged Center for the Study of Global Christianity, Church Growth, Open Doors, Persecution, Persecution of Christians by russmitchell. Bookmark the permalink.